Bocides and Preservatives are essential chemicals for controlling microbial fouling, spoilage and corrosion in industrial fluids and consumer products and for preventing contamination by microbes which threaten health. They progressively lose efficacy if the concentration falls. 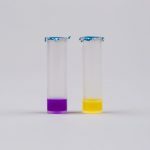 The Biocide Rapid Test consists of ampules of gel which contain the spores of a thermophilic Bacillus (a safe and harmless bacteria) and an indicator which changes from purple to yellow when growth occurs within the ampule. The sample to be tested is added to the ampule which is then incubated. After 3 hours and 15 mins of incubation at 64° C the growth of the Bacillus is assessed by examining the ampule for a change in colour. If it does not change colour, the sample must have contained sufficient anti-microbial chemical to inhibit the growth of the Bacillus. 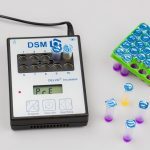 The test is used for the detection of anti-microbial chemicals (biocides, preservatives) either as a presence absence test, or, by testing a range of dilutions of the sample, as a quantitative test. Industrial Fluids that are shock dosed with biocide (e.g. process and cooling waters) must be dosed with an adequate concentration of biocide for a predetermined contact time. Frequently biocide activity is lost so quickly by dilution or inactivation that the treatment is ineffective. The concentration of the shock dose and its persistence can be validated with the Biocide Rapide Test. Industrial wastes which contain biocides or other toxic chemicals may be an environmental hazard or may prejudice the operation of biological waste treatment plants. The Biocide Rapide Test can be used to quantify biocides in fuel. A fuel sample may be added directly or biocide can be first extracted into water which is then tested. The shelf life of many preserved products relies on the long term persistence of the anti-microbial preservative. 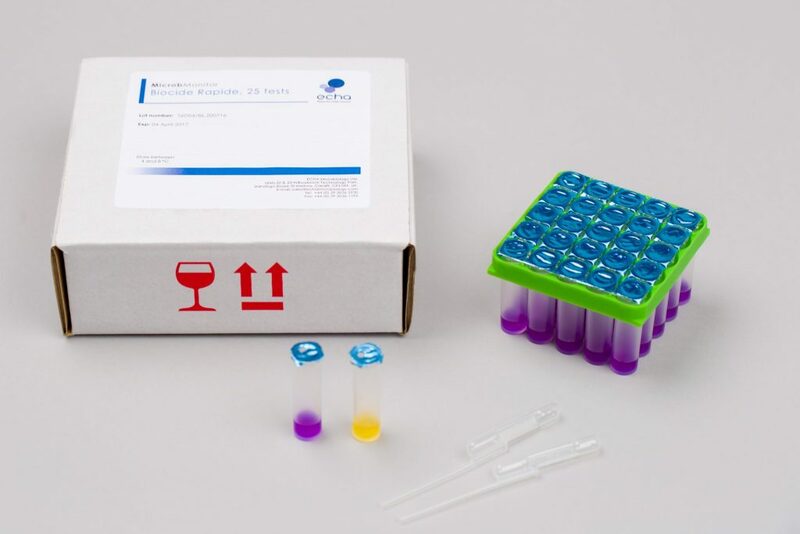 Any loss of activity can be detected by complex and expensive microbiological challenge testing or by a simple procedure using the Biocide Rapide Test. The fluid is assayed for anti-microbial activity at intervals and a biocide ‘top-up’ is made if necessary. 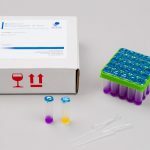 The Biocide Rapide Test must be incubated at 64°C and therefore requires a specialised incubator that is capable of maintaining this temperature. The Biocide Rapide 10 Well Incubator operates at 64°C on 230 V AC and contains a digital thermometer and timer. It can be supplied alone or as part of a starter pack with 25 Biocide Rapide tests. The expiry date of the Biocide Rapide Test will be printed on the exterior of the packaging. It is manufactured with 1 year shelf life and we try to supply product with a minimum of 6 months remaining. If you require a longer shelf life than this then please request this at time of order and we endeavour to accommodate your request. How should I store the Biocide Rapide Tests? 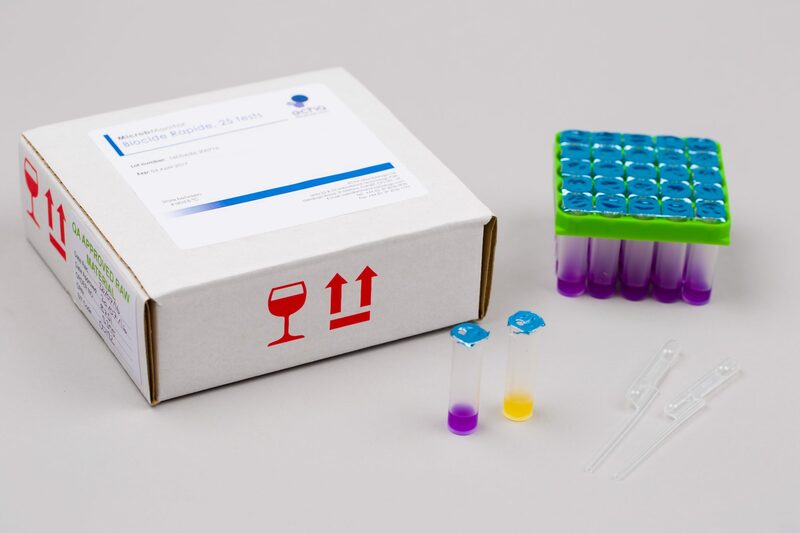 Biocide Rapide Tests should be stored refrigerated between 2-8°C. Any Tips for doing the testing? The Minimum Inhibitory Concentration (MIC) of the antimicrobial in use might be affected either in a synergistic fashion or antagonistic manner by other chemicals in the liquid being tested. Therefore it is always recommended to conduct a calibration for the antimicrobial being used in a sample of the liquid. Standardise the time of removal from refrigerated storage before use. Ensure adequate time is allowed for ampules to reach ambient temperature. Standardise the incubation period for each ampule at 3 hours and 15 minutes (or a time you have decided on for your testing). Ensure each operator understands what is a positive and negative result and thus avoid subjective operator errors. Enables target concentrations of Biocides to be easily maintained, overdosing or under dosing of biocide can be avoided. Can be used by any personnel with a basic knowledge of fluid measurements and dilutions.